The month of August is a month of summer TV season wind-down and these next two weeks are mostly packed with season finale’s for the summer shows. I’ve been working on the 2011 Fall TV Season premieres list which should be coming in by the end of this month on GeekTonic. For now read on for the GeekTonic weekly TV update highlighting all the new premieres, finales and specials coming up this week. Falling Skies (10pm oon TNT) Season 1 2-hour finale. Yes it was picked up for a second season. While some sci-fi fans have been complaining of too much character background stories and not enough aliens and action, this series had cable TV’s top series launch in terms of viewers so far in 2012. Hillbilly Handfishin’ (10pm on Animal Planet) New animal/nature series where people from around the world travel to Oklahoma to try noodling, where they go into deep, murky waters to catch catfish with their bare hands and feet. Strike Back (10pm on Cinemax) New drama/action series where an American, ex-Delta Force operative works with the British military to stop terrorists. In the Flow with Affion Crockett (9pm on Fox) New comedy by executive producer Jamie Foxx. Hosted (and starring) by Affion Crockett this is a sketch comedy series featuring spoofs of pop culture, movie trailers, commercials, TV shows, music videos and celebrities. This premiere episode guest stars Snoop Dogg, Russell Simmons, Chris Brown and more. The Lying Game (9pm on ABC Family) new family drama/sitcom series by the author of “Pretty Little Liars”. This one is about identical twin sisters separated at birth, one wealthy and the other poor. One finds out she has a twin and…. Boxee is about to get some SageTV goodness. Since GoogleTV “stole” away the SageTV team to work on their fledgling GoogleTV the SageTV user group – many of whom tend to lean towards the developer-crowd has been trying to find ways to make the most of the situation. A group of these developers recently started a project to make a SageTV for Boxee app that will at least help the situation. Sample Logo pictured above was created by Karl Ricker – one of many possible logos to be used in the final app. 1. No new licenses – You can’t purchase a new license for SageTV. This means no new users, and no expanding to additional computers beyond what you already have licenses for. They did offer free upgrades to the latest version of SageTV if you already owned an older version however. 2. No new extenders – SageTV sold their own awesome SageTV extender/media player devices which was one of the appeals of SageTV. But the moment Google purchased the company, those extenders were no longer for sale. One of SageTV’s strengths is it’s DVR functionality. It would just so happen that one of Boxeee’s weaknesses is the inability to “do DVR.” In just a matter of days, a fairly large number of developers who have worked on various SageTV 3rd party apps have joined together to build a SageTV for Boxee app. They even have a proof of concept version of this app available to download! 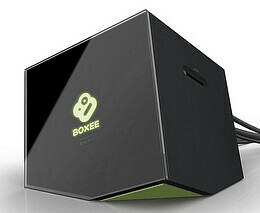 This boxee app should work on both the Boxee computer software version AND the Boxee Box! The proof of concept already has the standard SageTV UI which bodes well for getting the awesome 3rd party add-ons (Phoenix and Diamond anyone?) on Boxee. Some video playback works great already, but the Boxee box is more limited in playback capability compared to the SageTV HD300. Longer-term they plan/hope to get LiveTV working as well. It’s not as good as seeing SageTV HD300’s go up for sale again, but it’s pretty good news for most of us using SageTV still. Plus you get the online video awesomeness of Boxee as well. This is just one example of how devoted and talented the SageTV community is. I hope Google recognizes this is part of what they were getting when they purchased SageTV – whether they realized it at first or not! Hello August! We’re winding down the summer TV season these next two weeks leading up to the Fall Season premieres coming soon. Read on for the GeekTonic weekly TV update highlighting all the new premieres, finales and specials coming up. Against the Wall (10pm on Lifetime) New police drama series where a 32-year-old cop accepts a detective position with Internal Affairs, causing a rift with her family of cops. Starring Treat Williams, Rachael Carpani & Kathy Baker. Take the Money and Run (9pm on ABC) New reality series by executive producer Jerry Bruckheimer & Bertram Van Munster who did the Amazing Race. It goes like this: In San Francisco, brothers look to hide a suitcase containing one hundred thousand dollars from local police detectives. If the detectives do not find the money in a set amount of time, the brothers get to keep the money. Truck Stop Missouri (10pm on Travel) New reality/travel docu-series. Really glad to see my state represented on TV, but did it HAVE to be this???? Phineas and Ferb: Across the 2nd Dimension (8pm on Disney) A kids cartoon series that sounds a little “Fringe”-like. Friends With Benefits (8pm on NBC) New romantic sitcom with the 30-minute pilot followed by a second 30 minute episode. Two best friends carry on a casual physical relationship as they search for love.